On this date in 1573, miscarried justice took the head of Scottish cavalryman Hugh Cahun in Stockholm. Modernizing in the 16th century, Sweden flattered Scotland with deepening ties not excluding marriage feelers for Mary, Queen of Scots. When a rising Sweden’s ambitions brought her into conflict with Russia, Sweden summoned thousands of Scots soldiers to her banner. 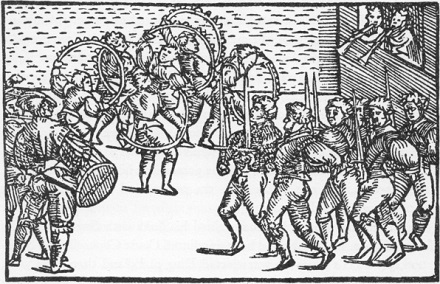 1555 illustration of a Scottish sword dance in the chronicle of Swedish monk Olaus Magnus. (Source). In the summer of 1573, Cahun caught wind of recruitment among these foreign auxiliaries for a plot to depose the Swedish King John III in favor of his imprisoned predecessor Erik XIV. Cahun reported the plot, but he didn’t know enough about it to make it stick to someone else — so perversely, he himself became the one suspected of seditious design. He would have cause to regret his severity soon enough: in the months to come, it would emerge that the plot was actually being spearheaded by a French loyalist of Erik named Charles de Mornay, who would himself be executed the following September. On this date in 1621, Spain’s once-powerful Marquis of the Seven Churches fell as far as tragedy can drop a man. 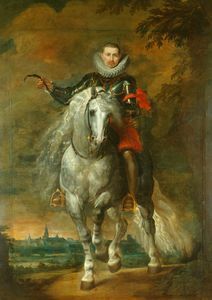 Still to this day a Spanish emblem of the perils of ambition, Rodrigo Calderon hailed from the minor nobility in the rebellious Low Countries breaking away from Hapsburg rule. Displaced to Spain, Calderon had a meteoric rise as the trusted henchman of the Duke of Lerma — who was himself the trusted (some say over-trusted) favorite of the Spanish King Philip III from the moment the latter came to the throne at age 20 in 1598. It’s not what you know, it’s who you know. Calderon’s who became perhaps Spain’s most powerful figure, and surely its most resented. By Philip’s own decree, nothing came to the royal quill but through his valido Lerma. Lerma dominated access to Philip and to a great extent, Calderon dominated access to Lerma. Both men prospered accordingly. Inevitably, such a figure attracted the resentment of other courtiers, and not only courtiers. Calderon almost fell in 1607 for extracting bribes far in excess of what acceptable corruption permitted. But he had by then the open enmity of the queen herself. It’s testimony to Lerma’s power that his patronage sufficed for Calderon to maintain his station in the face of such a powerful foe. Queen Margaret died in 1611. The cause was complications from childbirth, but rumors, like this anonymous pamphlet, hinted at other hands in her death. moved by the outcries of the people and the advice of wise and virtuous persons … felt obliged to confront the ill intentions of those who without doubt have caused her death. Her goal was to serve our Lord by promoting justice in the distribution of favors, appointments of good ministers, and the elimination of bribes, simonies, the sale of offices, and the promotion of unworthy and inept persons. Nothing troubled, Calderon had become a marquis by 1614. But the rumor mill played the long game. 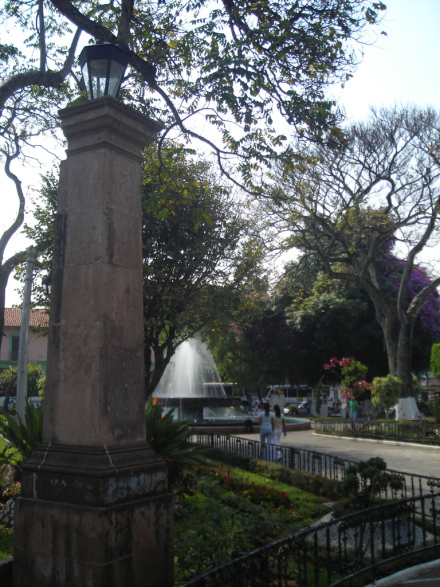 Calderon’s patron Lerma was displaced by his son in 1618, leaving his longtime crony vulnerable to the next turn of fortune. That turn was the 1621 death of Philip III himself and the succession of a 16-year-old son, Philip IV. Determined to rein in the perceived decadences of the last era — this period was the peak, and the very start of the decline, of Spain’s wealth and global power — the younger Philip’s Lerma figure the Duke of Olivares had Calderon arrested. Regicide and witchcraft were right there on the charge sheet, but it was the murder of a different man in 1614 allegedly killed to keep him silent about Calderon’s misdeeds that sustained the sentence. A bit more exotic than regular beheading, Calderon had his throat slashed, then was left to bleed out on the scaffold. As Calderon had come to personify courtly corruption, the new regime anticipated a salutary effect from making an example of him. To their surprise, the pitiless and obviously politically-motivated handling of the fellow — who bore his fate with lauded stoicism — made the late grasping aristocrat the subject of no small sympathy. * Calderon was himself a great collector of art. To prove to all the people how holy and inviolable are those walls of the city [of Moscow], which the Strelitz rashly meditated scaling in a sudden assault, beams were run out from all the embrasures in the walls near the gates, on each of which two rebels were hanged. This day beheld about two hundred and fifty die that death. There are few cities fortified with as many palisades as Moscow has given gibbets to her guardian Strelitz. On the 21st a circumstance occurred which created much controversy. A reputed Obeah-man was tried by court-martial and convicted. One of the favourite assertions of these people has been that “Buckra can’t hurt them.” Colonel Hobbs directed him to be placed on a hill-side, about four hundred yards from the firing party. The bullets caused almost instantaneous death, and it is stated that the effect on the minds of the prisoners was so great, that the colonel felt at liberty to release a considerable number then in his camp, many of whom were heard to say they never would believe in Obeah again. 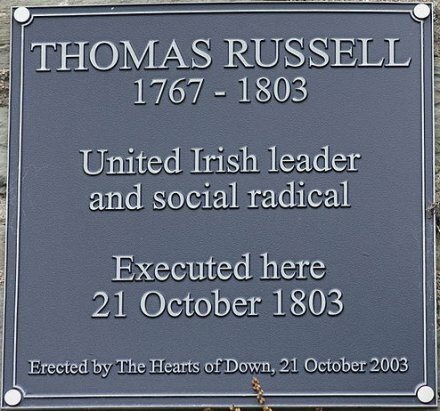 On this date in 1803, Irish revolutionary Thomas Russell was hanged at Ireland’s Downpatrick Gaol. Russell was such a republican original gangster that as a young junior officer in the British army in the late 1780s, he refused to eat sugar because it was the product of the empire’s slave plantations. (Hardly a bygone issue.) And while his own family was Anglican, Russell was also a staunch supporter of the then-radical (to Anglicans) position of Catholic equality. For Russell, this personal stuff was all most intently political. And his politics in no way ended with the dumbwaiter. Subversion was Russell’s game for the remaining years of his life; his Letter to the People of Ireland unveils a Tom Paine-like vision of a revolutionary world — a world that the ancien regime would remain violently vigilant against in the wake of the recent French example. Like many of the most dazzling egalitarian dreams of that insurrectionary moment at the end of the 18th century, it’s still never been realized. Russell actually spent most of his final decade imprisoned without trial while tragic Irish insurrections came and went. 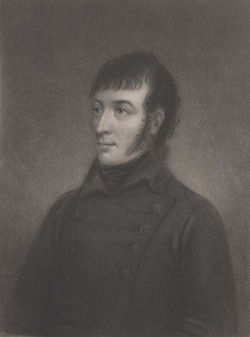 England finally released him to Hamburg in 1802, and as might be expected, Russell was so itchy by then to get back in the scrap that he immediately broke his parole to return to Ireland for the next available rising. He joined up with Robert Emmet‘s rebellion — another doomed patriot; Russell was his designated organizer of the north — but found little success canvassing for potential rebels and took the field on July 23, 1803 in a gesture of little more than hopeless romanticism. His band fell apart and fled without a shot fired. Memorial plaque in Downpatrick commemorating Russell’s execution. (cc) image from Ardfern. The British did what the British always did and hunted down the Irish rebel, while the Irish did what the Irish always did and stuffed his remains in a ballad. * It’s called “The Man from God Knows Where” — and God knows, two centuries later, where that man has gone. That the Wrong would cease and the Right prevail. Was the Man from God-knows-where! * Russell tried his own hand at verse, and some Jacobin lines in his hand helped to hang him, e.g. Photo believed to have been taken shortly before Carpentier’s execution. 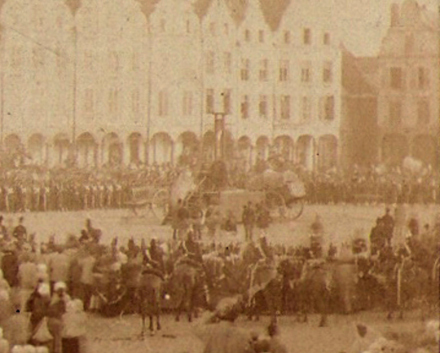 According to Bois de Justice, whose collection of guillotine arcana is second to none, this is one of the rare photographs extant of the guillotine in its more classically inspired public-scaffold setup. With the best part of a century under its lunette, the guillotine at this point had been improved from the revolutionary original that Marie Antoinette or Robespierre died upon. 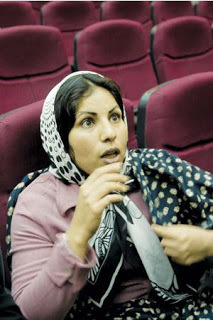 But it had the same theatrical concept. From then on, the business was to be conducted by a traveling executioner with a portable guillotine at ground level, meant to reduce the carnival atmosphere and centralize administration of justice. This concession to an age’s liberalism might well have led to an abolition on public executions full stop, had the French state not simultaneously fallen apart. 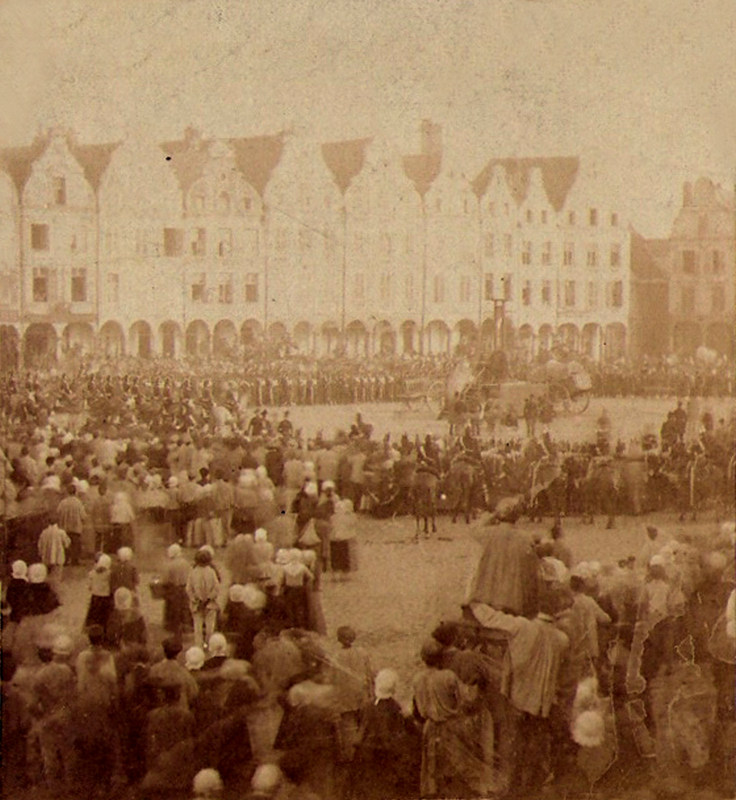 The upshot was that the French public beheading — sans scaffold — would persist for seven more decades, long enough not only for photography but for film. 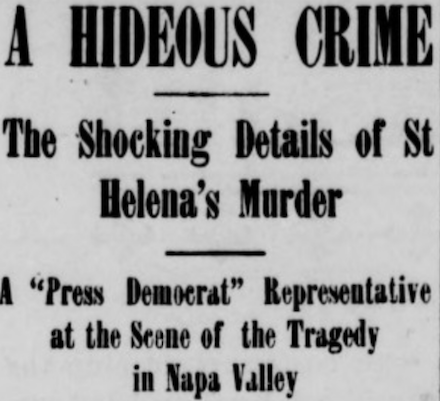 * For murder and robbery on the highway, as reported by the September 16, 1869 Le Figaro. 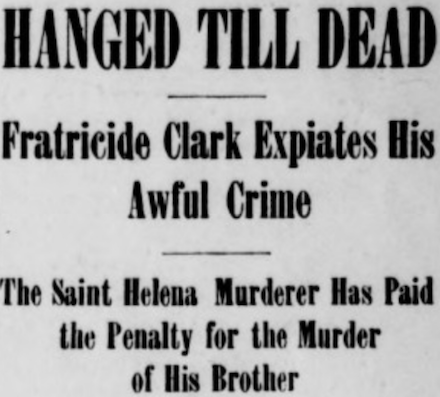 Noting the contrast with some recent acquittals of other criminals, the paper remarked apropos its skeptical stand on the death penalty that “though Carpentier is very unattractive at least from what we know of his case, we confess sincerely that his conviction was not sufficient to convince us [of capital punishment], because it proves once again how juries in different places arrive at different verdicts for the same types of crimes.” Le Figaro anticipated that regional inconsistencies in sentencing would contribute to ending the death penalty.